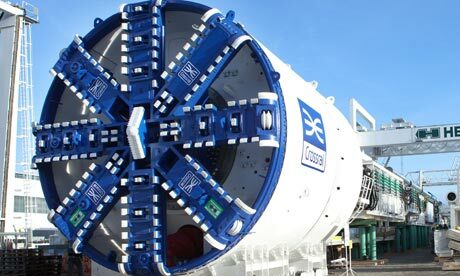 Britons were treated to a rare glimpse of a new rail network dubbed the ‘infrastructure solution to the shrinking economy’ this weekend, as Crossrail celebrated its first kilometre of construction. At a cost of £14.8bn, the project will connect Heathrow and Maidenhead in west London with eastern areas Abbey Wood and Shenfield. This weekend marked a milestone for the operation as its machines reached Paddington. A reported 4,000 skeletons have been discovered during construction at the site of a 16th Century hospital. The finished Crossrail network, expected to be operational in 2018, will host 37 stations, seven of which will be new underground sites at Paddington, Bond Street, Tottenham Court Road, Farringdon, Liverpool St, Whitechapel and Canary Wharf. The project is said to provide a 45-minute or shorter commute for an extra 1.5 million people into central London. However, with the city’s population growing at its current rate, critics argue that the even the new expansion will be insufficient for its transport needs. The material excavated from the Crossrail construction, around 4.5 million tonnes, is being used to create Europe’s largest man-made coastal reserve at Wallasea Island. Short of space on the Underground? Find an efficient packing solution for all your business needs at Gate8.